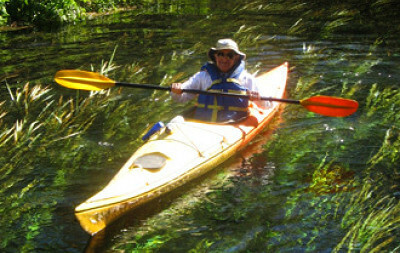 Easy paddling each day with lots of breaks for relaxing, wildlife viewing, and exploring. $1,200 per person, double occupancy. 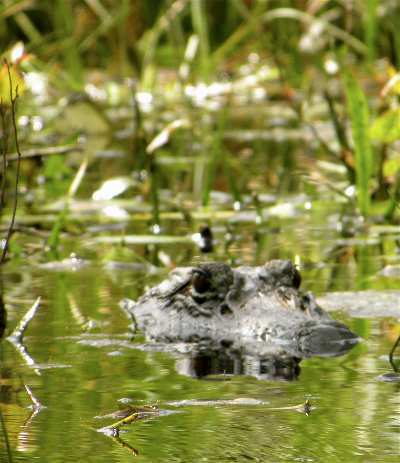 Join us as we travel deep into the most remote areas of the Okefenokee Swamp. 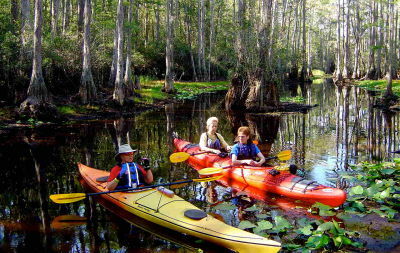 On this tour our group will encounter flooded cypress forests decorated with Spanish moss, kayak across open prairies covered in blooming pitcher plants, and view black bears, otters, sandhill cranes, ospreys, alligators, bald eagles, and yellow-fringed orchids. 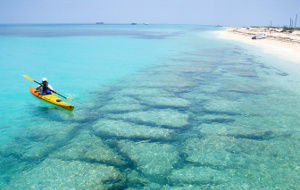 Though pure and clean, the refuge’s waters are dark due to the tannic acid in decaying vegetation. A number of freshwater springs feed the refuge, which in turn gives birth to the well-known Suwannee River and the St. Marys River which flows out to the Atlantic Ocean and terminates at our next destination, Cumberland Island, Georgia. 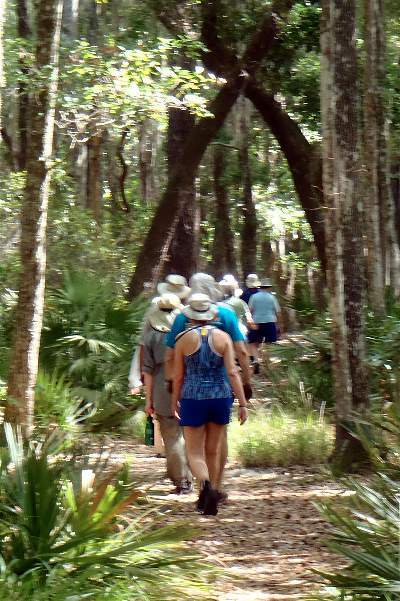 During our stay at Crooked River State Park, we will spend a day exploring Cumberland Island, which is protected as a national seashore. Eighteen miles of beach, thirty miles of trails, pristine wilderness and diverse plants and wildlife await us. Sea turtles, manatees, wild horses, bobcats, armadillos, various sea life, and more than 300 species of birds call Cumberland Island and its surrounding waters home. Here, creatures of the forest and shore live by both tidal and seasonal rhythms. We will also encounter several historical mansions and ruins, originally home to the Carnegies and other prominent families. Day 1 — Our private vans will meet everyone at noon outside Jacksonville International Airport baggage claim. Making our way to the Swamp, our group will stop for lunch. Upon settling in to our cabins, we will have time for formal introductions, go over dry land paddling instruction, and get out on the water for a short paddle. Dinner will be served outside. Day 2 — An exciting day awaits, as we paddle through “The Narrows,” the source of the Suwannee River headwaters. There is a visitor center next to our cabins, as well as the nearby Suwannee River Visitor Center. You will have a few hours to explore the area on your own before dinner before we go on a group night-hike that evening. 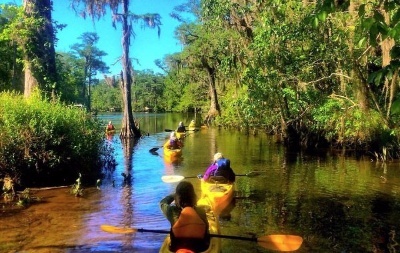 Day 3 — After another amazing breakfast, we will load up our kayaks and paddle to Billy’s Island which is now wilderness, but once housed thousands of timber workers, Seminole Indians, and other civilizations dating back thousands of years. We will share a picnic lunch on the island. Afterwards, we will paddle and explore Big Waters canoe trail and a few of our guides’ favorite and most picturesque areas in the refuge. Day 4 — Probably our longest and most action packed day. 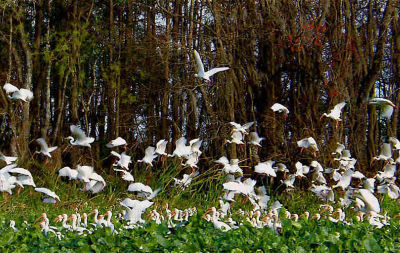 We pack up and get an early start, traveling 75 miles to the Suwannee Canal Recreation Area on the east side of Okefenokee. 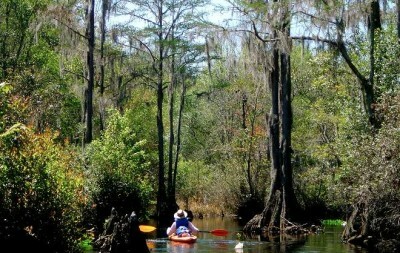 We will pass the “Trail Ridge” on the drive over and paddle remnants of the Suwannee Canal. We will also stop at the visitor center, an old homestead, and do a short hike to an observation tower where the view is incredible. We will stop off for a group dinner (not included in trip price) on our way to Crooked River, a short 45 minute drive away, where we then settle into our new cabins. Day 5 — We take the ferry boat over to Cumberland Island where we have an entire day to take in the island. For an additional $16, you can rent a bike and the leaders will take you on a bike tour of the island. 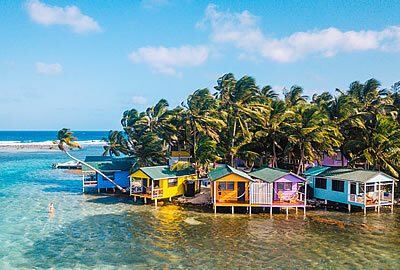 You can also opt to do a short four-mile hike, listen to a ranger presentation, visit historical ruins, comb miles of secluded beaches, or just relax. Ocean water temperatures average in the 70s in late April. There are no supplies on the island, so we must bring all supplies, lunch, etc., with us. Bringing a daypack will make it easy to lug your gear around all day. We have to be sure to catch the 4:30 p.m. ferry back to St Marys or we will be spending the night on the island. Dinner will be at the guides’ favorite fish house. Day 6 — We will shuttle to and paddle a section of the St Marys River today. Day 7 — We will have breakfast, make lunches, and pack up. 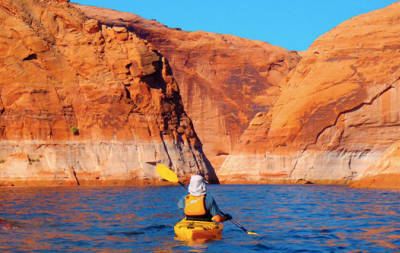 A short morning paddle on the amazing Crooked River is planned and the trip will be complete after lunch around noon. Our vans will transport everyone the 45 minutes back to Jacksonville at that point. Our first three nights lodging will consist of cracker style cabins in the absolute heart of the Okefenokee Swamp. There are full amenities, which include air conditioning, full bathrooms, kitchens, a large living area, dining area, and a screened in porch with lots of rocking chairs. Rooms are double occupancy. Our next three nights will be spent in similar cabins located on the banks of the Crooked River. The leaders will prepare most meals, however, lunch on the first and two dinners out will not be covered in the trip price. 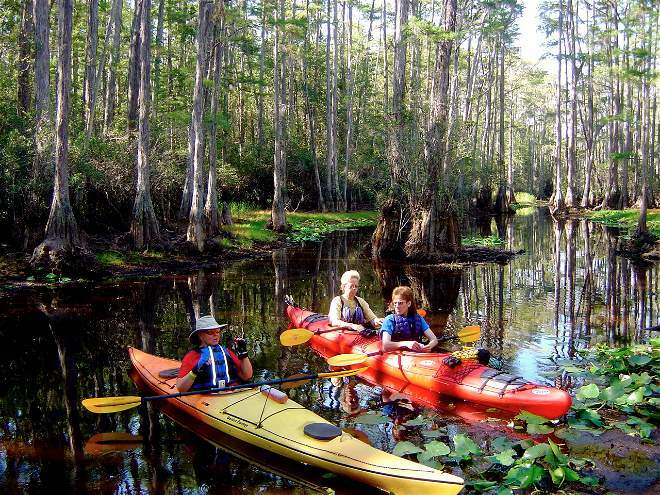 We are very proud of our Okefenokee Swamp and even more proud to be one of only three Adventure guides allowed to offer overnight wilderness tours into the refuge.